I had sort of a sad encounter yesterday. I was at Panera grabbing a bagel and a lady commented on the fact that she liked my tights. 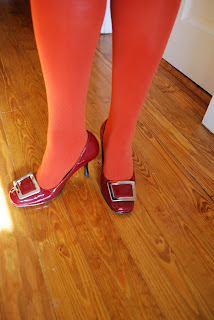 I love to wear tights, especially colorful ones. They are the easiest way to create a new outfit or add a pop of color and, frankly, I wear tights and stockings all year round. So, getting a appreciative response is always fun. I said "Thank you" and went on to say how I had wanted to dress cozy and comfortable that day. 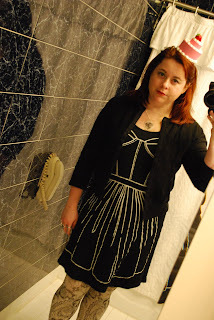 It was raining/snowing out and (being still sick) I had dressed pretty simply - black sweater dress, the tights and black patent mary janes. Nothing to crazy or over the top at all. The lady went on to say how she wished she could wear tights like that and I said "of course you can! 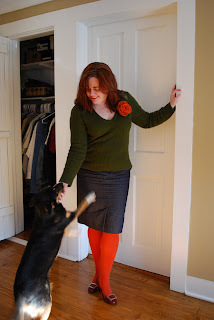 I have a ton and wear fun and bright tights all the time!" But she dismissed this saying she was worried she would look like she was trying to look like her teen-aged daughter. I tried again to assure her she could wear them - heck, she couldn't have been that much older than me - but she acted as if there was no possibility she could pull it off. This made me so sad. First of all, I don't think colorful tights are that crazy or pushing the envelope. I mean, you are just as covered as if you were wearing tan hose or black tights, which most ladies would not bat an eye at. Plus there are all ranges of colors and patterns. 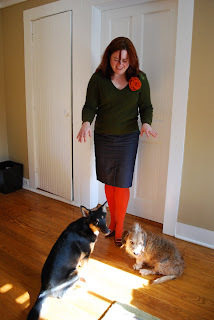 I can see how some patterns could be considered too strange but there are people I know who are unsure about wearing solid color tights in any color outside of black, brown or grey. Is it that colors outside of the "safe" zone are too attention-grabby? Is that a bad thing? Why do you think many women feel they can't or shouldn't wear fun colors and resign themselves to blending in versus standing out? Even when they want to? I came home from New York with a terrible cold that I'm still trying to get over. But, I still have to go to work, you know? I just want to be snuggly and comfortable but not resort to the typical black. Say Hi to the pups! Back to the business of getting well. I was so excited to get a seat at the Arise Magazine African Collective Part III show this season. I was going to go last season but had to leave early and missed it. And this was a beautiful show. Taking place in three parts with three designers spanning First Light, Noon and Midnight, the show space was conceptual and had great depth. 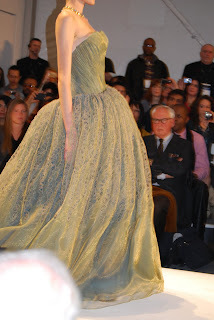 I have each segment on video with the final walk through showing all of the looks. The first segment is Black Coffee from South Africa. This show featured the most amazing coats that were so oversized and lush. While they were wool, it was great to see a warm luxury look without the use of fur. The Noon segment was Loin Cloth & Ashes from Tanzania. I loved the translation of the origami bird motif were pulled through to the folds and cuts of the clothes as well as in the accessories. The third segment was Deola Sagoe from Nigeria. This collection was unique in its inspirations from Maasai warriors combined with 18th century European military uniforms. You would think those would be incongruous from one another but the intricacy of each complimented the other. One of the best parts of going to New York for Fashion Week is seeing so many of my favorite people from the online world. Some I've met before and some I had the opportunity to meet for the first time. That's why when Miss DreamSequins arranged a quick meet-up near the Tents, I was excited to attend. 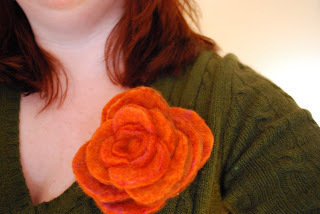 I totally swiped the above image from her blog post, so check it out to see her coverage. I know she did some other videos that are still pending, so I'm going to check back. 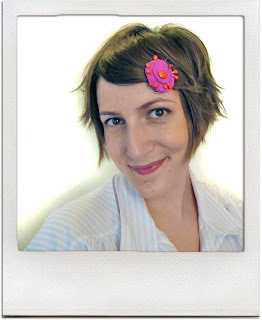 She was covering shows at the Tents and the IFB event, so be sure to check out her videos. And to everyone who stopped by, it was so to meet you in person! I think half the fun of Fashion Week are the parties and meet-ups that go on all around the core events. 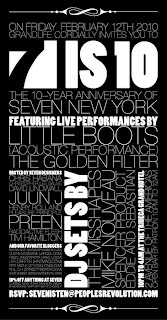 And the 7 is 10 party did not let us down. The party, held at the Tribeca Grand, was packed! The line was down the block and inside was just as crazy. 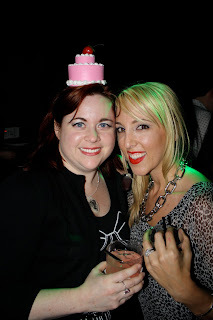 I was able to hang out with Nova Style and friends, Dream Sequins and spend a good bit of the evening with The Shoe Girl and her adorable hubby. 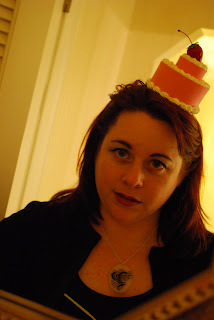 I have decided that my new party strategy is to wear a fabulous headpiece because people could not get enough of my delicious Agent Lover-created cake hat. Girls begged to wear it for photos, guys tried to french it. It was a magical evening all around. I wore my Behnaz Sarafpour for Target lace cardigan over the Rosalind Keep Trompe L'Oeil Prom Dress from Oasis. 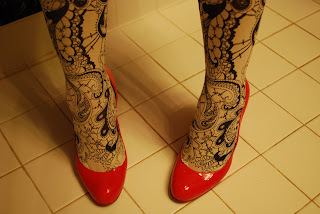 I did wear the Bebaroque Betty tights but might go for a solid next time. I did want to contrast with the pink Louboutin Simple Pumps and it was darn cold out. 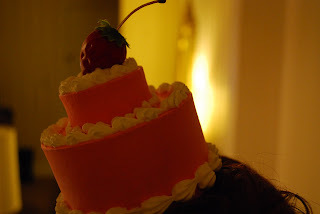 You cannot resist the cake hat! 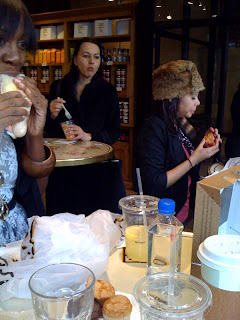 Actually, I was representing my lady bloggers all around - Agent Lover cake hat, Paraphernalia Petit Nom Initial necklace and Wendy Brandes Swear rings. I also made the extra effort with some false eyelashes. As eyelashes go, these were pretty subtle. I'll put the large images on Flickr so you can see them up close and personal. There are bound to be images floating all over the internet from this party because people were taking pictures left and right. It was a lot of fun especially as I was up way past my bedtime... but well worth it! 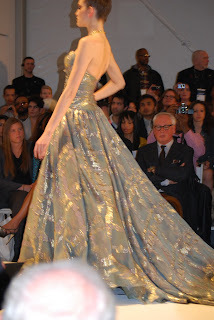 I was excited to see the Kati Stern Venexiana show while I was at Fashion Week. And I was not disappointed. While I was sad to see so much fur as a part of the show, which for some reason I wasn't expecting, the evening wear was gorgeous. 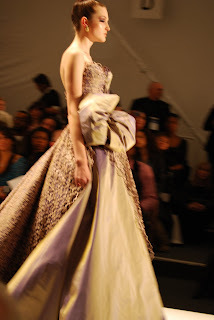 There was a beautiful range of fabrics which is what stood out the most to me. 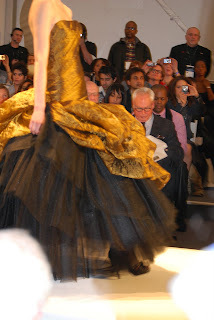 The range of black, cream and gold, as well as navy, sage and lavender was elegant but in a very refined way. 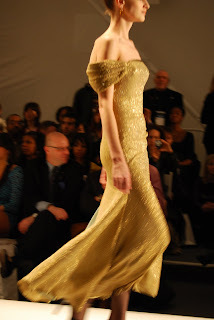 The show featured several dresses in this striking gold. This mix of colors was lovely in person. Click to enlarge and see the beautiful flounce on the bodice. 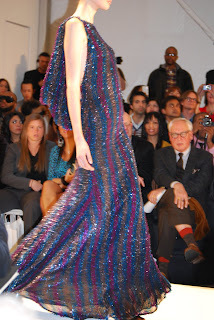 This very sparkly dress was a bit of a stand-alone during the show but you had to admit it jumped out at you. 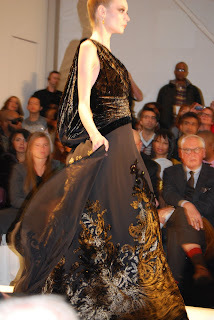 The burned out velvet was a great contrast to the lightness of the skirt. I love this oversize and shimmery plaid. 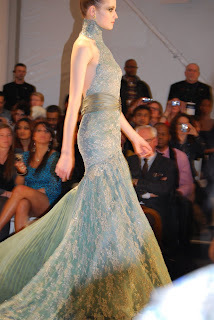 I'm not typically a fan of the mermaid style but I loved the pleated inset in the back. I need a place to wear a big princess-y skirt like this. 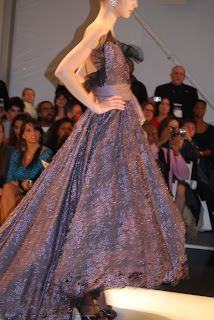 But the showstopper of the night was this lavender and black dress. It's hard to tell in a still image but this dress moved! Those tiers were amazing and I was in awe. I need a good long entrance, a party to wear it to, and that dress. I mean, damn! I don't have nearly enough opportunity to dress formal anymore but just knowing there are dresses like these out there makes me happy. 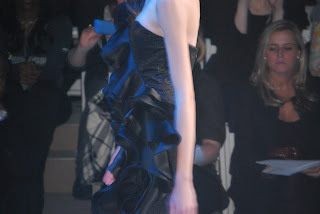 More images to be found on my NYFW Fall 2010 Flickr set. 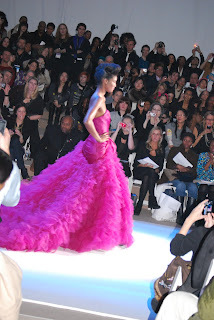 There was quite a huge crowd for the Christian Siriano Fall 2010 show but luckily I was able to snag an aisle seat and grab some shots of the show. Overall I felt a very late 1930s - early 1940s evening wear feel about the pieces with soft drapey, flowy gowns, large ruffles and languid bows which were combined with strong and sometimes excessive shoes. Per the information provided, Christian was "inspired by 1960s Parisian women who dressed up every day." The shoes were inspired by 18th and 19th century French antique furniture with filigree detailing and clawfoot lion's paw foot tubs. 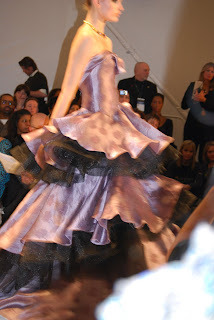 The ruffles were a very strong theme from the dresses down to the Cabriole evening shoe shown in black and royal blue satin. I found the severe Gladiator boot to be a challenging pairing with the flowy dresses but they could be an interesting work boot. The shoe styles had very modern shapes, especially this Cloven boot, with wedge heels. 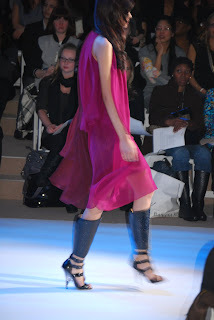 Surprising with the My Man Godfrey style dresses. There has been a statement that a limited edition "direct-from-the-runway" capsule collection will be available in select store in early March. I think it would be great if they do bring the full runway style to consumers. 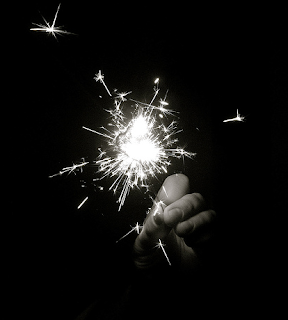 It's time for another sparkly Sparkler!!!! Thanks for asking me to do this. It was harder than I thought! Everyone should try making these lists - it's good to remind yourself of things you take for granted or to find the positive in your life. Why not celebrate why you think you're great and how your life is great once in a while? Have you made a list? * I love making, crafting, fixing, drawing, sewing, painting, DIYing...and I think I am pretty good at these things. * I believe in biorhythms, sort of. * So far, getting older is pretty awesome. The past few years have shown me that - hey! guess what? It's my life! I've observed how life falls into place without a struggle when I honor myself, listen to my heart and let me be me. I've learned I can do things I that I once thought were beyond me - and I can do them well (surprise!). I've also figured out that when I honor myself I make more genuine work. It shows and in the end it is better for this reason. I am looking forward to growing into a stronger more confident individual who sees the positive side of life and rolls with the punches on the daily. Because everything works out in the end! * I am good at thinking in pictures. This is a problem when I can see the image of an object but can't find the word for a couple seconds. * I have my own personal alarm clock in the form of my cat, Simon. He also tucks me in at night. * I've managed to keep a hold of some of my bestest friends for around 20 years. I am pretty lucky because they are genuine, kind, generous, smart, hilarious and basically totally awesome. * I get to crack up at least once a day because I have a hilarious boyfriend who also fits the friend description as mentioned above. 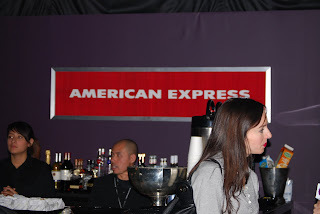 On Friday I had the opportunity to spend time in person with some of my favorite bloggers in the American Express Tent Lobby Lounge and the Skybox. Typically these venues are used to provide some amazing card member Fashion Week experiences, but in conjunction with the IFB Blogger Conference, a few of us were able to check the space out, have some refreshments and spend an hour with Fern Mallis, who is the Senior VP of IMG Fashion which is the company that puts on Fashion Week. It was a great opportunity to ask her some questions about the future of fashion and Fashion Week, especially as it is moving to Lincoln Center next season, access to the shows and her thoughts on traditional versus new media. 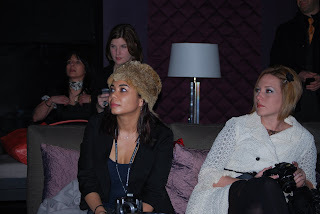 We all were live tweeting using #amexMBFW to track the comments so you can check them out too. And of course lots of photos were taken! 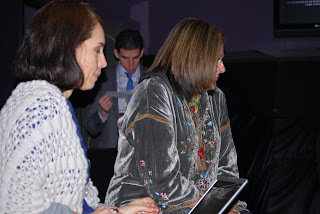 It was a great opportunity to see the space, talk with Fern and connect with other bloggers. It really showed how smart and savvy these writers are. It gives me great hope, especially as Fern said she would be checking out the sites of the attendees, that the independent media's influence will continue to grow. I also think its important for these companies and brands to know how passionate these writers are and that they can provide just smart, comprehensive and influential coverage for the shows. 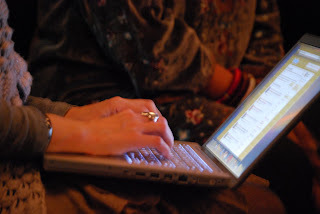 Continue to provide us with access and we will give you smart coverage and a real passion for Fashion.